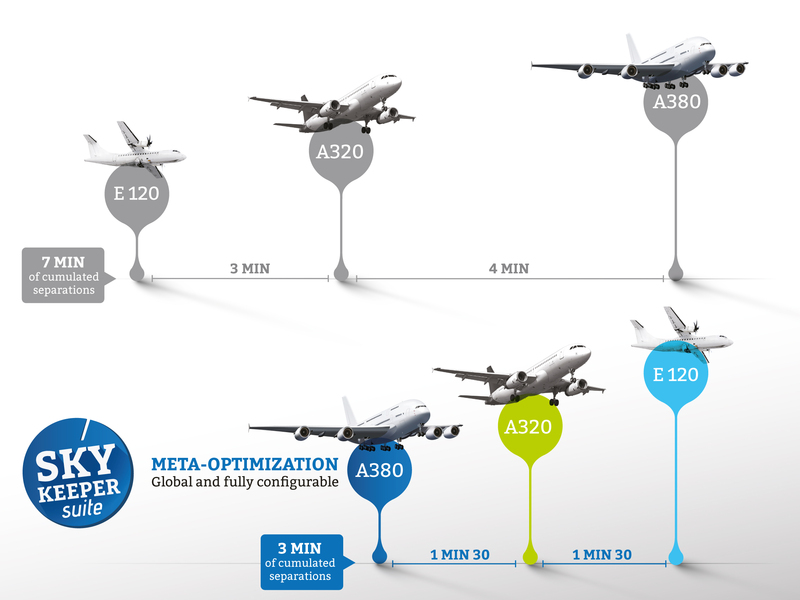 Revolutionizing the First Come – First Served strategy that has been used for the last 20 years, our integrated flow management solution for arrivals and departures offers global sequence optimization. The outcome stems from the use of artificial intelligence algorithms, based on a behavioral analysis of ants. Contrary to other systems, our approach uses natural sequencing, a flexible method allowing optimization and an increase in capacity. Based on static management, our solution relies on dynamic functions and determines a sequence 90 minutes in advance, while relying on traffic prediction. We use precise data, such as the exact time taken for each aircraft from gate to taxiway, to optimise the sequencing of flights at departure, runway capacity and to regulate the flow of aircrafts entering the airspace, such as Terminal Management Area (TMA). It also aims to provide predictability for both ground and air users and reduce holding and low-level vectoring, minimizing the impact on the environment.